"little soldiers" because the sprouted seed looks like a helmet. The first two Costa Rica trip report installments (part I and part II) covered five days of our trip. Today's installment only covers a few hours. But it was a particularly special few hours for me because we got to discover the origins of one of my favorite things in the entire world - coffee. I've been obsessed with coffee for as long as I remember, and not just because it got me through four years at Cornell University. Obsessed enough, in fact, that one of my college graduation presents was a fancy burr coffee grinder (like this one), and I currently have a Melitta single cup brewer, Aeropress, French press, and Turkish coffee pot at home. There are so many variable affecting the taste of coffee, including the bean's country of origin, the roasting process, storage process, age, exposure to air, even the grind and the time between grinding and brewing. It's fascinating, and the resulting product is among the most delicious beverages out there, in my opinion. The afternoon of June 19th, after goofing around in the rainforest and hoping the clouds would give us a view of the Poás Volcano's main crater, we moved on to our next stop for the day - the Doka Estate. Given my obsession with coffee in general, touring a coffee plantation was one of the highlights of the entire trip for me. By the time we pulled into the estate, I could hardly contain my excitement. Enough, in fact, that fellow #OmniTen Weston offered to take my picture in front of the entrance as soon as we got off the bus. The entrance to heaven on earth - the Doka Estate plantation. 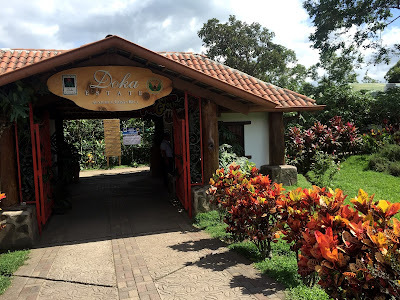 We learned that 90% of the coffee in Costa Rica is destined for export, and the Vargas family started growing coffee at the 450 acre Doka Estate in 1940. Since 1989, Arabica beans are the only variety that can be grown in all eight Costa Rican coffee regions by law; it's considered the best of the two coffee bean varieties. Robusta, the other type of coffee bean, contains more caffeine and is generally heartier, but in Costa Rica, you'll only find Arabica beans. 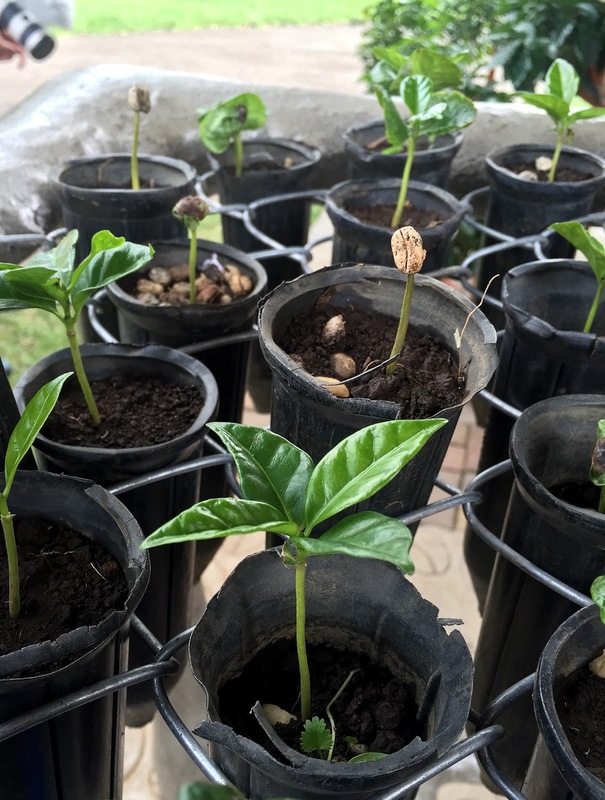 It takes between three and four years from the time when a coffee bean is planted, germinates, is transplanted, and finally becomes ready for the first harvest. Most plants, according to our Doka Estate tour guide, can live up to 25 years. Harvest season lasts from October to March, and from March to May, the coffee plants are in bloom. 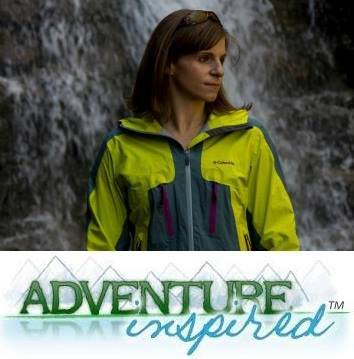 We missed both of those events, arriving in mid-June, but there was still plenty to see. 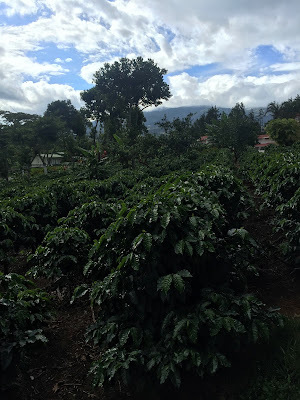 As we wandered the estate, our tour guide pointed out a handful of other species of trees and plants that are strategically placed around the coffee plants to distract bugs. After learning about the process of planting and growing the coffee plants, our guide explained how the Doka Estate's wet mill works, the oldest wet mill in Costa Rica. During harvest season, workers pick coffee fruits from the plants by hand. They're paid by basket, and a good picker can harvest 15-20 baskets per day. Once the coffee cherries are picked, they're sent to a giant holding tank where they're immersed in water. Good coffee cherries sink to the bottom while rotten or unripe cherries float. Coffee plants as far as the eye can see! Once the good cherries are separated from the unripe and rotten cherries, they're sent through machinery that removes the skin and some of the pulp. A fermentation process allows the rest of the pulp to be removed, and once that process is complete, the beans are washed and dried on large patios. The coffee beans are flipped and turned by rake on a schedule to make sure they're dried evenly. 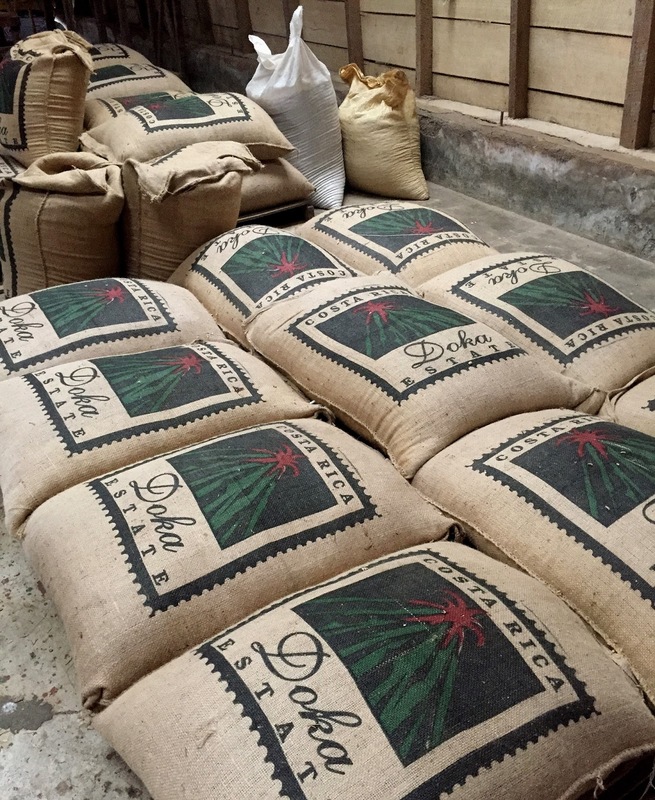 Some of the beans are exported around the world, (coffee is the #2 most traded commodity on earth), while a small percentage remain at the Doka Estate for roasting and sales. Before, during, and after the tour, we had the chance to sample some of the different roasts. We learned that peaberry beans make up 3% of the harvest, and it's a particularly special type of bean. There are normally two seeds (beans) for each fruit (coffee cherry), but sometimes there's only one, and in that case, all of the nutrients are collected in one bean. During processing, these seeds, called peaberry, are separated because they produce higher quality coffee. However, they're also sterile and can't be replanted. So, of course, knowing the peaberry beans were special, as soon as we finished up the tour, that was the first brew I tasted. I ended up coming home with six bags of whole bean coffee for myself and to share, including the breakfast blend, peaberry AA, and house blend. I also had the chance to sample Costa Rica's version of iced coffee, which had the taste and consistency of a refreshing coffee milkshake. Dried beans bagged and ready for export. Overall, it was an incredible experience to see how growing a plant in the ground on a hillside in Costa Rica results in my having amazing roasted beans available at home. I have an even greater appreciation for those who grow, harvest, and process the beans, and highly recommend the tour we took to anyone interested in learning where coffee comes from. After the tour, we jumped back on the bus and headed back to San Jose to rest up before the last leg of our trip, which we'll cover next week! Everything related to the coffee production process noted in this post was covered on our tour. Long story short, our guide was amazing and I learned a ton. Have you ever toured a coffee plantation in Costa Rica or elsewhere? Did anything about the coffee production process surprise you? What's your favorite coffee brewing method? We'd love to hear from you!